Minimally invasive thoracic surgery refers to surgery of the lungs and chest that is performed though small incisions. It is performed using a thorascope (a camera on the end of a long tube that is inserted through a small incision so the surgeon can see inside the chest), and either specialised, long instruments (commonly called video-assisted thoracic surgery or VATS), or a surgical robotic system. Lobectomy – a large section of the lung is removed, commonly performed for lung cancer. Wedge resection – a wedge-shaped portion of lung tissue is removed, commonly performed for the diagnosis or treatment of small lung nodules. 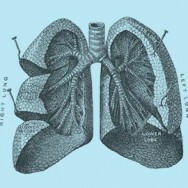 Lung biopsy – a small sample of lung tissue is removed through a small incision between the ribs, which is examined by a pathologist to make a diagnosis. Drainage of pleural effusions (thoracocentesis) – used to drain a build-up of fluid around the lungs, which can be collected for analysis of possible causes such as infection, cancer, heart failure, cirrhosis or kidney disease. Sterile talc or an antibiotic may be inserted at the time of surgery to prevent the recurrence of fluid build-up. Other procedures – it can be used to examine mediastinum (area in the middle of the chest between the lungs), pericardium (area surrounding the heart) or thymus (a organ near the bottom of the throat), remove tissue samples or surgically remove cancerous growths in the affected area. Three small (approximately 1-inch) incisions are used to insert the instruments into the chest, as compared to one large (approximately 6- to 8-inch) incision used during traditional, open thoracic surgery. An additional 3-4 inch incision on the side of the chest, between the ribs is sometimes needed, for example during a lobectomy. The surgical robot that Sydney Heart & Lung Surgeons use is called the da Vinci Surgical System. The length of your hospital stay will depending on the procedure that is performed. In general, patients who have thoracoscopic lung biopsies or wedge resections are able to go home the day after surgery. Patients who have a VATS lobectomy are usually able to go home 3 to 4 days after surgery. As with all surgery, there are some risks. These include an air leak requiring the chest tube to remain in for longer than planned; bleeding; wound infection; pneumonia, injury to the surrounding lung tissue, heart, liver and kidneys; and possibly death. Conversion from the minimally invasive approach to the traditional, open approach may be needed.